Microsoft Teams VS Slack: How they are different from each other? 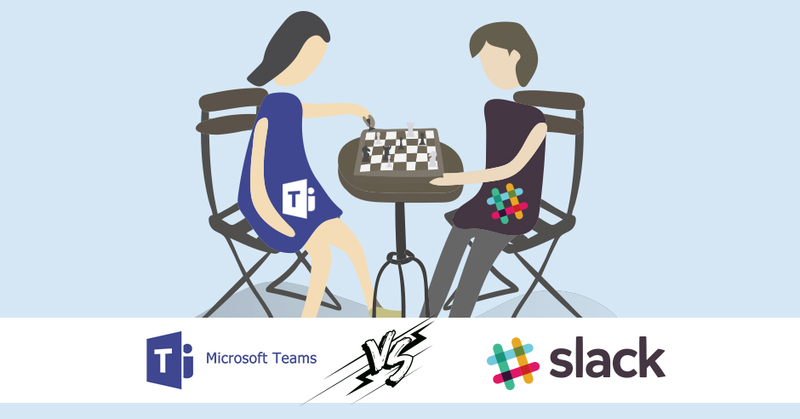 blogs Microsoft Teams Vs Slack: How they are different from each other? As mentioned in our earlier post that we have started crafting down the ‘X’ Series vs Slack of articles to let users know the existing collaboration software and making it easier to discover the best outfit. At this moment, we are decoding the dissimilarities between Slack and Microsoft Teams, which are poles apart in their strengths and weakness. Since the advent of team collaboration software, Slack has been acknowledged as the cool kid. He delivers things in his way with a fancy interface and unique combination of features. Well, keeping analogies on the couch, team chat applications have waved goodbye to the internal email structure and phone calls at the organizations. Pricing - Which Application Breaks the Bank? Your greenbacks go more for Teams than Slack. Yes, it is true. For those who are unfamiliar, Teams did not have a Freemium version like Slack; but in July Microsoft has announced that a new grade of Teams is available at no cost in order to stand in the Slack competitor bar. Now, since both the applications come with Freemium editions, the ball is in your court - whether to upgrade or not. The pricing for Microsoft Teams starts at $6 per person if you remunerate monthly with which you can obtain Office 365 Business Essentials account that incorporates several Microsoft services such as OneDrive, Skype, Exchange, and SharePoint. And the next edition come on the scene with $15 per person for a month. Along with the aforementioned features, it provides Word, Excel, PowerPoint, OneNote, Outlook, and Teams. The pricing for Slack starts at $8 per person if you pay monthly and you get Slack alone. It does not compose of any paid-worthy feature such as single sign-on option, accurate uptime, administrations benefits, etcetera. Those expect extra bucks from your pocket which makes the bill oversized. Upon taking into account the costings of both the applications, Slack charges almost the same without the involvement of business services. That being said, you are devoting to a huge package of services when you purchase a Microsoft package. And, both the applications offers enterprise-grade plans if you want to check out. Troop Messenger (we) – a unified and user-friendly team messaging platform has made it official that the application is free until March 31st. Just saying! Getting Started - Which Application Offers Smoother Setup? Well, it is not going to be a smooth road while deploying Microsoft Teams. Making the first move with Teams takes hell lot of time since you are expected to present a set of information such as personal data that includes business email (no cheating, okay? ), mobile number, and credit card information(in case of premium version). However, Slack’s deployment is as smooth as cheesecake. It does not ask you for any credit card or personal information unless and until it is a paid version. In a nutshell, it took me almost seven minutes of time to deploy Slack whereas almost an hour for Microsoft Teams. For those who are in one hell of a hurry, we have compiled a quick synopsis of the differences between Slack and Microsoft Teams. Layout - Which Application Gives Comfort Over Chaos? The layout of these applications appears like they have been cut from the same cloth. Like every team collaboration software, a left rail consists of channels or groups, conversations, tasks, and anything you have pinned to the top. The nucleus part concentrates on the details of the chosen conversation. And the right rail is subjective. For instance, Troop Messenger focused on the information that is one more layer deep such as filters, screen sharing and other contents of a conversation. It has to be understood that both are having a small vertical dashboard for conversations, contacts, and channels. Coming to Slack, it is busy as the bee. It is visually intense with eight customized themes giving end users a chance to alter the dashboard of their workspace as they want. Furthermore, if you are a member of numerous workspaces, you can choose a different theme for each workspace giving you a crystal clear workflow. And Microsoft Teams does not short your expectations either. It gives you even more command over conversations with the help of personalized tabs. Speaking technical, MT has an additional vertical that consists of tabs like Teams, Chat, Files, Meetings, and Activity. Messaging - Which Application Made it a Cakewalk? Both the applications offer instant messaging in one-to-one and groups/channels versions. These two applications have likewise messaging features such as supporting and sharing all types of media, editing, deleting, mentioning any member (in case of a channel) with @, threading etcetera. By any chance of speaking about differences, Microsoft Teams holds the cup with advanced designing tools within its messenger such as the possibility of changing the font color. Similar to WhatsApp, Teams also supports the feature of emoticon search. To elaborate more, when you are in a dilemma of which emoji to pick out, you can simply type the name of it and Teams get it for you. Also to messages, Slack permits you to reach with smileys whereas MT has limited it to Like (thumbs up) symbol. Wrapping up, I would say that both Slack and Microsoft Teams have exceptional messaging features. Notifications - Which Application is legend-ary? Since notifications is a significant feature in business messaging applications where end-users gets decided whether to halt or continue. Speaking of these two, I would say that Slack has star-studded features in customizing the notifications. You can set up the alerts of your preferred keywords, you can set you to personalize your notifications in terms of Do Not Disturb for a predetermined time or you never want to hear from that person or channel at any point. Slack even allows you to set distinct preferences for mobile and desktop versions. In Slack, users can update the status automatically if you are going for a meeting or lunch or just taking a quick nap. When it comes to Microsoft Teams, the settings are umm, a bit feeble. You cannot customize channel notifications i.e., the settings are applied to all channels; you cannot personalize for one particular channel leaving the rest as active. Also, Teams has provided only four options such as busy, available, away, and Do Not Disturb. Whereas in Slack, you can update the status as what you want. You can include text, image, emoticon and many more. For instance, if you are on vacation, chillin’ in the beach, you can keep the status as clinking beer mugs followed by a text up to January 3rd. Isn’t it legend-ary!? You tell me, please. Video and Audio Calls - Which Application Offers Crystal Clear Outlook? I have tested both the tools with my fellow workers in the office and we had a bit leisure doing this. It is a known fact that post the purchase of Skype, Microsoft has been producing new facets to the web or video conference in the business world. Everything Microsoft works on responsive calling appears on Teams simultaneously. You can hold audio and video calls, web conferences within the house or offshore. In addition, Skype has a built-in broadcasting feature where you can host a one-day meeting with almost 10, 000 other participants where Slack of it. You can even switch from a video call to instant messaging with just a button. Besides that, Teams has an inbuilt feature of recording the call. And that recording will come into view of your chat feed once you are done with the discussion. Teams is over Slack in video calling because you can only have one-on-one calls with a free plan and the group call head-count is limited to 15 whereas Slack has drawn a line at 80. Integrations - Which Application is On Good Terms With All? It goes without saying that Microsoft Teams is integrated with Office 365 apps where you would not find any issue in adding third-party services and Tools like Trello. Although MT has a total of 180+ integrations while Slack has gone a long way in providing 800+ external integration systems. Support - Which Application has a Better Helping Hands? Let us assume that I want to make some X as an admin but I do not know how to do it. So, where should I look for? Looking left and right give any assistance? No, right? Under these circumstances, Slack and Microsoft Teams both have decided to help you me out in their own way. In MT, the usual way to get help is through T-Bot. It pops up in your dashboard the moment you sign in. As you want to make X as admin, you can type as “make admin” in a message box and it fetches you the instructions of how to get it done. In Slack, the simplest and flexible way to get help is to consult Slack’s Help Centre. I have to admit that Slack is few steps ahead in saving time and resolving the issue. When you just type the phrase “admin” the bot results the recommendations such as “how to remove Y as admin,” “how to make Y as admin” and much more. End of the day, I believe that Google can obtain you the fast and accurate answers than inbuilt help centers of Slack and MT. Huh! Sharing and exchanging files all-day long is one of the core activities in an employee life. Let it be of any format. In Slack, you can easily look through messages the files. It even allows you to search for the content that exists within the bounds of a file. So I decided to make sure of it. I shared a user guide of 5000+ words with my colleague long ago in PDF format. I just typed the phrase “run user” to examine whether it would work or not. And guess what, it did! And why to leave MT behind? I tried the same thing with Teams and it provided me the accurate results too. On the whole, Microsoft Teams is the finest application if you are possessing Business account already and you work more on Office 365 integrated applications. Slack is your way to go if you are looking for an adaptable and ardent interface that offers you a Freemium version and has some of the best third-party apps in the store. Let us know in the comments section below if we had missed anything. The aim of the article is to be informative. We intend users take an informed decision for an effective and productive experience. The comparison shown between Microsoft Teams vs Slack in the blog is only towards that end and has no intention of pitting one against the other team collaboration app brands. The images, logos, any concepts etc., used in this blog, purely belong to their respective companies or applications (Microsoft Teams and Slack). Readers are advised to consult and confirm from the respective service providers regarding details of features, latest updates, prices, and their policies before utilizing any of their services.This further informs the reader that the views, thoughts, and opinions expressed in this blog solely belong to the author’s perception, and not necessarily to the author’s employer, organization, committee or other group or individual.